The first phase of The Elements Unearthed is a feasibility study or proof-of-concept. During the first year (2007-08 school year) media design students at Mountainland Applied Technology College (MATC) traveled to several sites in Utah and interviewed scientists and engineers and videotaped their tours. These included the Ash Grove Cement Plant near Leamington, the Brush Wellman beryllium concentration plant near Delta, and the historic Tintic Mining District around Eureka. Their footage and photos were captured digitally and transcribed, then edited into video segments of about 15 minutes each. Each team had from three to five students and each student had specific responsibilities, such as editing photos or cleaning up the audio. Titles, animations, credits, and other clips were added and the whole video episode was exported and tested by other students. Their comments were used to revise the project. Results of the testing showed a number of areas that could be improved. These included shortening the episodes to a maximum of 12 minutes (15 minutes was a bit too long and seemed to drag), keeping the narration focused and engaging (some of the student narrators were a bit deadpan), using consistent styles and quality, and improving the process of team collaboration and reporting. Because of this feedback, the first episodes are now being revised with additional footage, better images and narration, and will be uploaded to our blog and podcast sites by the end of January, 2009. We are now starting the second round of podcast episodes for the 2008-09 year. Students have divided into teams and have chosen topics from a list of possible local businesses. These include how stained glass windows are made, how bricks are manufactured, the history and process of synthetic diamond manufacturing, how air is liquefied and distilled into its component molecules, and the history and processes of making pottery. The teams are researching their topics and are collaborating together via wikis to coordinate research and to write their initial episode scripts. These scripts can be edited by any other student in the group. Students have created their own journal pages where they can comment, ask questions, and make suggestions and where the Principle Investigator can also leave instructions. To improve the accuracy of their information, each group will work with a Subject Matter Expert (SME) who represents the site they are visiting. This person can be a scientist or engineer from a mine site or refinery, a docent or historian from a local museum or historical society, an artist, or anyone with detailed knowledge of the subject. As the teams develop their scripts, the SME will access the wiki site and make changes or suggestions to what has been written. Team members will ask questions on the wiki and the SME will answer them, gradually adding to the detail and depth of the group’s script. Once the team has videotaped the site and captured the footage to the computer, they will transcribe all the interviews and make final editing decisions. These transcriptions will also be posted to their wiki page and the SME will again check them for accuracy. Once the video segments are done, other teams will view them and make suggestions regarding quality and consistency and the SME will give approval. Once the final version is complete and exported, it will be compressed into H.264 or .mp4 format and metadata tags will be added to it, then it will be linked to our blog site and uploaded to several podcast and video aggregate sites, including YouTube, TeacherTube, the Apple iTunes Store, Podcast Alley, Podcast Pickle, and others. Included with many of the video podcast will be audio and enhanced audio versions as well as .pdf files that can be downloaded and printed. These written files will be a well-designed version of the final script with images and references. A feedback evaluation form will also be included in .pdf format so that our end audience can fill it out and return it to us. Phase I of our project will be completed by the end of May, 2009 and the lessons we learn from it will be applied to the design and delivery of Phase II, which starts June, 2009 depending on funding. In Phase II we will expand the project beyond the students at Mountainland Applied Technology College to include community teams from around Utah and neighboring states. The Intermountain West has a rich history of mining and chemical manufacturing, and we will solicit volunteers from schools and the communities where these sites are located. As the Project Manager, I will travel to various teacher conferences in Utah including the Utah Science Teachers (USTA) Conference on Feb. 20, 2009 and the Utah Coalition of Educational Technology (UCET) conference on March 6-7 to present the details of this project to other teachers and recruit them to be mentor teachers to student teams from their schools. For example, I hope to recruit a team and teacher from Bingham High School or Copperhills High School to research and document the history of the Bingham Canyon Copper Mine, or students from Park City to document the history of the silver mines there. If needed, I will send direct mailings, e-mails, travel to individual schools, and present to interested student and community groups to solicit at least five new teams for the 2009-2010 school year. To act as an incentive, depending on funding, I will offer mini-grants to the teachers who will mentor a team so that they can purchase necessary software and hardware for this project. By the end of May, 2009, the teams will be selected and initial visits and training done as to expectations, timelines, and communication/collaboration techniques. Once I return in the fall, I will be working on this project full-time (again depending on funding) and will work closely with each selected team as they develop their research into a wiki site. I will help them make contact and work with a Subject Matter Expert, and set up times for interviews and tours. During the week of their scheduled tours, I will visit the school and train the team members for several hours each day (after school) on how to use the video equipment (which I will bring), how to capture the footage and write transcripts, and how to edit it into final video form. Then we will will visit the site and interview the expert and tour the facility. Once the week of training is over and the footage is captured, the teams will work on their own (with frequent contact with me) and do the editing and revisions needed on their topics. Once the video is in beta quality, other teams and the expert will review it and the team will make final revisions and gain approval of the expert. Then the videos will be compressed to podcast format, metadata will be added, and they will be posted to this blog and to other sites such as YouTube and iTunes by May, 2010. During the spring, 2010, I will solicit more teams in Utah and start to branch out into neighboring states (Colorado, Nevada, and Arizona). Footage of the training sessions for this second phase will be edited into “how to” instructional videos for future teams, so that they can conduct their videotaping and editing more independently (as it will soon become impossible for me to visit each site). By the end of May, 2011, the second phase will be complete with about 20 additional podcast episodes completed by student/community teams and several episodes (mostly historical based on my CHF research) created by me. By this time, about 30-35 episodes will be complete. During Phase II, in addition to the prototype podcast episodes, some sample Flash-based games and a full website will be developed as prototypes of the ancillary materials that will be created in Phase IV. At the close of Phase II, our efforts up to that point will be carefully and completely evaluated to determine how effective the project has been, with success measured in how many people are downloading our podcasts, the number and quality of these podcasts, how many students have been involved and their feedback, and the extent to which we have increased excitement and knowledge of STEM careers and subject content. This assessment will be used to plan and apply for grants for the full project as Phase III. We will expand the project from just Utah and neighboring states to teams in states across the country (and theoretically the world). These teams will have to be self-motivated and taught using our on-line training materials (developed in Phase II) and will develop episodes that live up to strict standards in order to be included in the project. Over the three-four year length of Phase III, as many as twenty or more teams will create episodes, with over 100 being created altogether by May of 2015. Coinciding with Phase III, I will develop a series of ancillary materials including website, posters, broadcast videos (perhaps a mini-series of six one-hour episodes compiled and re-edited from the student projects), curricular materials, on-line games, PDFs with lesson plans and fact sheets, and even a coffee table style book. These materials will be developed to extend the reach of the project and provide additional resources and teaching tools for teachers and to help promote the project for the general public. Whereas the podcast episodes created by students will be distributed for free, it is anticipated that the ancillary materials will be created for profit and to help support the student/community arm of this project. Depending on the grants that we will receive, it is anticipated that we will complete all final assessments and reports on this project by the end of 2015. Next time: How you can help! For our last two entries I have written about the need and rationale for The Elements Unearthed project. In this post, I would like to present our third and final reasoning behind this project, journeying into the nebulous and contended realm of educational theory to present the conceptual underpinnings of our project. 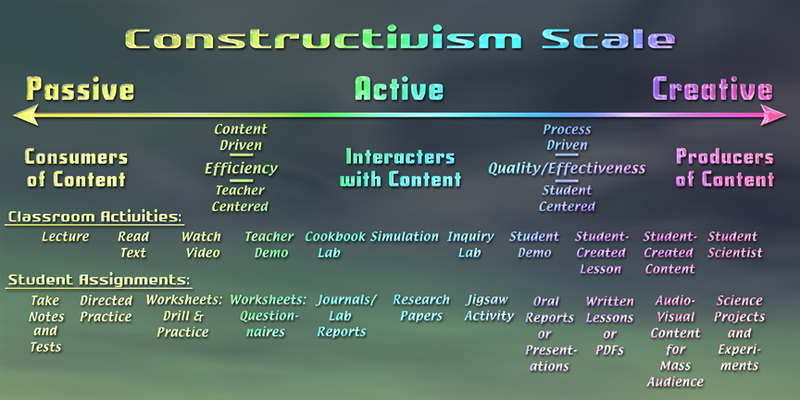 Student learning activities are often charted out on a continuum or dichotomy with Passive on the left and Active on the right. Such activities as taking notes, listening to lectures, and watching a video in class are passive whereas such activities as open-ended labs (inquiry labs) and research projects, simulations, and student presentations are active. I propose that this scale is only partially complete. Beyond hands-on or inquiry activities is a whole other level of student involvement in learning: students as creators, producing their own knowledge or making content for others. As such the spectrum would place Passive activities on the left as before, but now place Active learning in the middle and Creative activities on the right, where the student becomes responsible for creating material for and teaching knowledge to other students. Instead of being consumers of content or even interacters with content, students become the producers of new content. They become the teachers. In the diagram shown, certain educational models begin to fall into place when compared with this new scale of constructivism. On the left of the continuum, the teacher is the center of the classroom and dispenses knowledge with a focus on efficiency – pouring as many facts into the minds of the students as quickly as possible in assembly line fashion. As we move toward the middle, activities and assignments become more student-centered and involve the student actively, getting them out of their seats and into the lab or participating in a simulation. Instead of rote regurgitation of facts, student assignments become more open-ended and subjective, more imbued with meaning and interpretation; requiring evaluation and comparison on the part of the student. As we move beyond hands-on into the realm of student-created content, the student and the teacher reverse roles. The teacher becomes more of a coach or mentor, a facilitator of learning. This side of the continuum requires self-motivated students willing to dig for their own knowledge; having learned how to learn, they pursue their own lines of inquiry and even create their own experiments to uncover new knowledge. They ask questions and find answers, either through original experimentation or primary source historical research. They become scientists and teachers, training their peers and creating original content for fellow students and even for the general public. They now internalize their learning and own it; they won’t forget it or become uninterested or bored with it because they are fully engaged. Instead of writing a research paper that only the teacher will read, their work is actively critiqued and utilized by others. The focus now becomes quality and effectiveness of learning instead of efficiency. The effect of students creating their own content and knowledge is profound. Not only do students retain the knowledge they create longer (usually indefinitely) but the motivation and excitement of the students increases. As they see that what they are creating is meaningful and relevant, as they discover the scientist and historian within themselves, not only does their ownership of the knowledge increase but so does the quality and thoroughness of their work. I first discovered this effect by accident. As a first time teacher of chemistry at a small school in the Sierra Nevada Mountains called Tioga High School, I was presenting a unit on organic molecules and their naming conventions. Instead of lecturing on all the alkanes, alkenes, dienes, and so on I decided to let the students research this on their own and report their findings to the other students. This type of “jigsaw” activity can be useful as it puts responsibility on the students to find their own answers and learn from each other. I was also the computer teacher at this school, so I opened up the lab and had the students create their reports in the form of a Hypercard stack on the Mac Classics we had in the lab. They were required to present the information with graphics and also to create some kind of quiz or game based on their content that the other students would then take to demonstrate their knowledge. As students got into the project, I was amazed to see that instead of complaining about having to do research, they were actually asking me to open the computer lab during lunch so they could work on their Hypercard projects. They became very creative in how they presented their information but even more so on how they structured the quizzes; they wanted to do things that would be funny or surprising to their peers while also presenting accurate information. In the process, they truly learned the material. Their test scores were much higher on this unit than before. At other schools where I have taught I have instituted some form of student-created content made with the intent of teaching other students (instead of just the instructor). At Juab High School in central Utah, students in my chemistry and physics classes created demonstrations and mini-lesson plans on the chemical elements and principles of physics to present to each other for feedback, then perfect and present to students at two local elementary schools and to the public at a back-to-school science night. At Mountainland Applied Technology College, students have been required to look up tutorials on software packages such as Adobe Photoshop, practice them, write up their own lesson plan, and then present it to the other students. In each case student motivation and retention has been excellent. The only drawback is that such activities take more time than traditional rote learning so not as much content can be “covered.” But when the focus shifts from coverage to quality, I find that less is indeed more. Now I am not trying to say that the activities and types of assignments on the left are bad. There are times when a great deal of facts must be covered quickly and a lecture with note-taking is simply the best way of presenting the information. For students who are less self-motivated or less mature, the activities on the left and center are effective, and there are times when teachers need to have more control over the content and the direction of students. As students gain more experience and take more control of their own learning, they should naturally start moving toward the right side of the continuum. Even in the teaching profession we see this – teachers in training gain facts first in content area courseware, then go through various stages of methods courses and lesson plan development practice before presenting lessons to fellow teachers. They eventually move up to teaching a single class of students for a limited time, then move on to full scope student teaching for a whole semester under the direction of a mentor teacher, then finally gain their credential and full-time employment. If we expect our teachers to follow this process, then why not our students as well? They can become apprentices of knowledge, progressing to journeymen students who create their own content and conduct their own research, eventually progressing to masters who are now totally in charge of their own learning. This is what we propose for The Elements Unearthed Project. Student teams will progress from being researchers to scriptwriters to video editors, at each stage trained and mentored by experienced media professionals and local scientists and historians. Not only will they become producers of content, they will also learn to evaluate and present that content in an aesthetically pleasing and factually accurate way. Although the content they produce will be of benefit to many students and teachers worldwide, it is the student/community teams that will gain the most. Local museums will receive high quality media content that they can display in their museums and on the Internet. Local chemical plants and refineries will gain valuable public relations exposure by telling their stories to the wider community. Team members (students and mentor teachers) will gain video editing and scriptwriting skills, as well as the chance to do primary historical research. Communities will gain from increased public awareness of the history and environment of the town. In short, everyone benefits. It is our hope that you will support this project by becoming involved directly as a sponsoring organization (a refinery, chemical plant, or museum) or by creating a team of your own to document the history of your area. You can also contribute to this project financially and receive sponsorship credits in the final podcasts and on this blog. Next week we will discuss the timeline and phases of this project and more on how you can get involved.